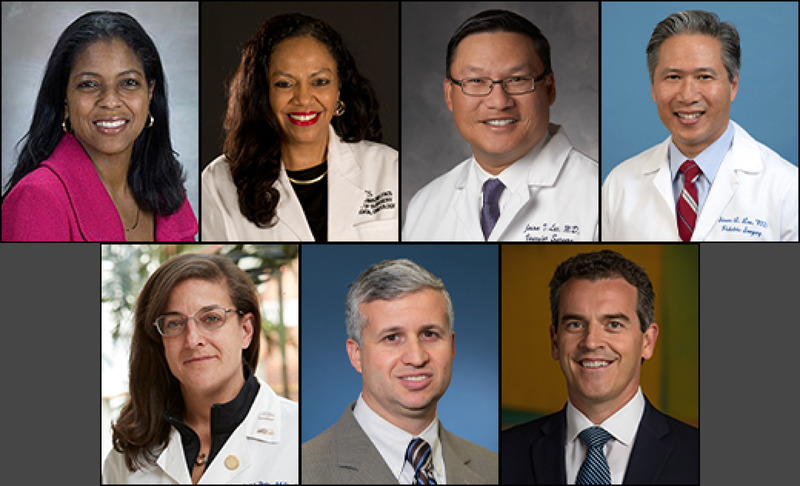 The American Board of Surgery (ABS), the national certifying body for general surgeons and related specialists, is pleased to introduce eight new directors who will join the board this July from the following organizations. They will each serve a six-year term. All ABS directors are currently certified by the ABS and meeting the requirements of the ABS Continuous Certification Program. Dr. Angelos is the chief of endocrine surgery, the associate director of the MacLean Center for Clinical Medical Ethics and the Linda Kohler Anderson Professor of Surgery and Surgical Ethics at The University of Chicago. Originally from Plattsburgh, N.Y., he completed medical school at Boston University, residency at Northwestern University, a clinical medical ethics fellowship at the University of Chicago and an endocrine surgery fellowship at the University of Michigan. A past president of the American Association of Endocrine Surgeons, Dr. Angelos currently serves as president of the U.S. chapter of the International Surgical Society and is a member of the American College of Surgeons Board of Governors. Dr. Chaer serves as the residency and fellowship program director and site chief at Presbyterian University Hospital in Pittsburgh. Born in Beirut, Lebanon, he attended medical school at the American University of Beirut, followed by a residency at the University of Illinois in Chicago and a fellowship at New York Presbyterian Hospital. Past president of the Eastern Vascular Society, Dr. Chaer currently serves on the executive council for the American Venous Forum and is a member of various writing committees for the Society of Vascular Surgery. Dr. Jenkins is a general surgeon for Carolina Surgical Care in Nags Head, N.C., as well as a clinical professor at the University of North Carolina (UNC) School of Medicine in Chapel Hill. Born and raised in North Carolina, he completed both medical school and residency training at UNC Chapel Hill, where he served as administrative chief resident. Dr. Jenkins is an Outer Banks Hospital Breast Conference Champion, serves on the Chesapeake Regional Medical Center Surgery Quality Committee and is a member of the Outer Banks Hospital Tumor Board. Dr. McMasters is the Ben A. Reid, Sr., M.D. Professor and Chair as well as chair of The Hiram C. Polk, Jr., M.D. Department of Surgery at the University of Louisville School of Medicine, with a current practice scope of surgical oncology. A native of Camden, N.J., he attended medical school at the University of Medicine and Dentistry of New Jersey (UMDNJ) Robert Wood Johnson (formerly Rutgers) Medical School, residency at University of Louisville School of Medicine and a surgical oncology fellowship at M.D. Anderson Cancer Center in Houston. Further. Dr. McMasters serves as a board chair for the University of Louisville Physicians and is a board member for University Medical Center, Inc.
Dr. Mitchell is the chief of general thoracic surgery, the Courtenay C. and Lucy Patten Davis Endowed Chair in Thoracic Surgery, and professor of surgery at the University of Colorado. Hailing from New York City, he attended medical school at the University of Michigan and completed his residency training at Massachusetts General Hospital. Dr. Mitchell currently serves as a director on the American Board of Thoracic Surgery. Dr. Olthoff is the Guthrie Professor of Surgery at the University of Pennsylvania and chief of the division of transplant surgery. In addition, she serves as the surgical director of the Liver Transplant Program at both the Penn Transplant Institute and the Transplant Center at the Children's Hospital of Philadelphia (CHOP). Originally from Ill., she completed medical school at the University of Chicago’s Pritzker School of Medicine, followed by both a residency and fellowship at the University of California School of Medicine in Los Angeles. A past president of the American Society of Transplant Surgeons, Dr. Olthoff is the current chair of the Liver Committee for United Network for Organ Sharing (UNOS). Dr. Robinson is the chief of staff at Northern Inyo Hospital in Bishop, Calif. and the assistant professor of surgery at the Uniformed Services University of the Health Sciences (USUHS) in Bethesda, Md. Her current practice in a rural, critical access hospital involves general and colorectal surgery as well as upper and lower endoscopy. A native of La Mirada, Calif., Dr. Robinson is a U.S. Navy veteran and attended medical school at USUHS, followed by residency at National Naval Medical Center and a colon and rectal surgery fellowship at Ochsner Clinic Foundation in New Orleans. In addition to her clinical responsibilities at Northern Inyo Hospital, Dr. Robinson serves as chair of the hospital's By-Laws Committee, head of the daVinci Surgical System Committee, and is a member on both the hospital's Credentials Committee and NIH Emergency Medical Committee. Dr. Tseng is the Utley Professor at Boston University School of Medicine and chair of the department of surgery, as well as surgeon-in-chief at Boston Medical Center, with a current focus on upper GI surgery. Born and raised in Berkeley, Calif., she attended medical school at the University of California, San Francisco, followed by residency at Massachusetts General Hospital and a surgical oncology fellowship at MD Anderson Cancer Center in Houston. In addition to her clinical and academic appointments, Dr. Tseng is the president of the Society of Asian Academic Surgeons, councilor for the Boston Surgical Society, and serves on the executive council for both the Society of Surgical Oncology and the Americas Hepato-Pancreato-Biliary Association. Andrea Hayes-Jordan, M.D., surgeon-in-chief of North Carolina Children's Hospital and division chief of pediatric surgery at UNC School of Medicine, will join the Pediatric Surgery Board representing the American Pediatric Surgical Association. Ronda S. Henry-Tillman, M.D., FACS, division chief of breast surgical oncology at the University of Arkansas for Medical Sciences, Winthrop P. Rockefeller Cancer Institute, will join the Complex General Surgical Oncology Board representing the American Society of Breast Surgeons. Jason T. Lee, M.D., professor of surgery at Stanford University School of Medicine as well as vascular surgery program director and director of endovascular surgery at Stanford University Medical Center, will join the Vascular Surgery Board representing the Society for Vascular Surgery. Steven L. Lee, M.D., chief of pediatric surgery and director of children’s surgery at UCLA Mattel Children’s Hospital and professor of clinical surgery and pediatrics at UCLA's David Geffen School of Medicine, will join the Pediatric Surgery Board representing the ACS Advisory Council for Pediatric Surgery. John C. Mansour, M.D., chief of surgical oncology at UT Southwestern Medical Center and leader of the Gastrointestinal Cancer Disease Oriented Team at the Simmons Comprehensive Cancer Center at UT Southwestern, will join the Complex General Surgical Oncology Board representing the Americas Hepato-Pancreato-Biliary Association. Andres Schanzer, M.D., division chief for vascular and endovascular surgery at the University of Massachusetts University Hospital and professor for both the department of surgery and the department of quantitative health sciences at the University of Massachusetts School of Medicine, will join the Vascular Surgery Board representing the Society for Vascular Surgery. Deborah M. Stein, M.D., M.P.H, FACS, FCCM , the R. Adams Cowley, M.D. Professor in Shock and Trauma at the University of Maryland School of Medicine, will join the Trauma, Burns and Surgical Critical Care Board representing the ACS Committee on Trauma. The ABS gratefully acknowledges the dedication and commitment of the following outgoing directors, who will leave the board as of July: Roxie M. Albrecht, M.D. ; Mark S. Allen, M.D. ; William C. Chapman, M.D. ; Dai H. Chung, M.D. ; Vivian Gahtan, M.D. ; Tyler G. Hughes, M.D. ; Anne G. Rizzo, M.D. ; and Spence M. Taylor, M.D. We also gratefully acknowledge the dedication and commitment of our outgoing component board and advisory council members, who will also be leaving as of July: Peter D. Beitsch, M.D. ; Michael A. Choti, M.D. ; Daniel G. Clair, M.D. ; Erica L. Mitchell, M.D. ; Frederick J. Rescorla, M.D. ; Ronald M. Stewart, M.D. ; and John H. T. Waldhausen, M.D.